Today is Memorial Day in the U.S. of A. I didn't call this post HAPPY Memorial Day cos I don't think this necessarily IS a happy day—or should be. Many humans think today is all BBQ's, shopping the sales and fireworks; but, in reality, it's to honor the fallen. Those heroes who went to war and never came back. Heroes like TW's Uncle George, who she never had to privilege to meet. He never came home during World War 2. 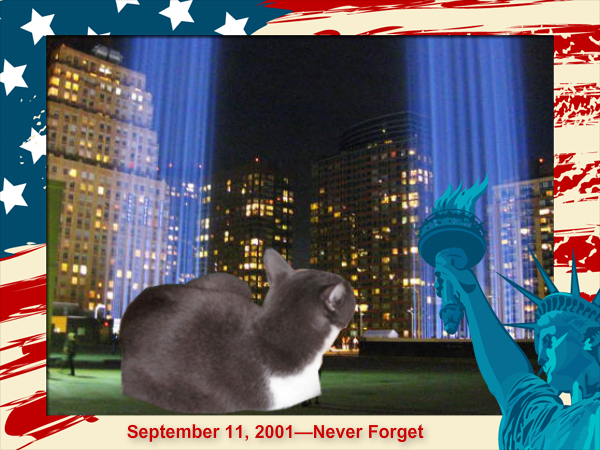 I’m sure most of my furrends from this country know someone who never came home. I got to thinking about this day and whether you could count the nearly 3000 people killed in the September 11, 2001, attack on the World Trade Center. IMSO, that attack was an act of war and the beginning of the War in Afghanistan (2001–present). I concluded that those innocent victims who went to work that morning and never came home to their loved ones should be remembered. They wore the uniforms of the working class; uniforms that reminded some of the freedom that is America. Wednesday, the 9/11 Museum opened on the site of the attack. Underneath the Museum lies the remains of the victims who have yet to be identified. This is sacred ground. I don’t think I’d be wrong to say that no one would party on the fields of Gettysburg or on Pearl Harbor. Yet, members of the 1% saw fit to drink and party in the Museum above those sacred remains. Many of the victims’ families were upset and the little ghetto kitteh doesn’t blame them. Click here to see a wonderful tour of the 9/11 Museum. I don’t think you’ll feel like partying. Today is a day of remembrance. That was a wonderful post CK and such great thoughts. We will remember all of our heros each and every day. Beautiful message on this solumn day, CK. And yes, I absolutely agree that the 9/11 victims should be remembered on this day as well. You wrote a very moving post CK. Nice one CK and you are so right re 9/11. We agree 100% with all you said. Have a great Memorial Day and a marvellous Monday. I think it is okay for humans to celebrate today, if they do it consciously, remembering the somber reasons for this holiday. If people can celebrate out of gratitude for the sacrifices made and lives lost - and celebrate those lives too - then it is another story. But then, I doubt many do that. I think they should definitely be remembered. I was torn on whether I should say "happy" memorial day or not on today's post. But it is good to remember the happy times shared with lost loved ones, even if losing them is so sad. Hope your peeps get to visit the museum some time. This is a great post to honor and remember those who lost their lives in service. And I agree with you about 9/11 victims. They should be remembered and never be forgotten. 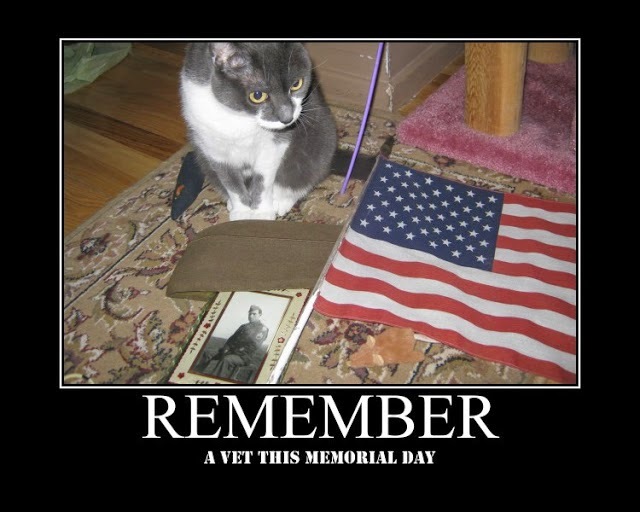 CK, you always do such a nice Memorial Day bloggy. Super job girl. We didn't get a post up - M hasn't felt good for 3 days now, but is getting better. What a great post, CK. Remembering of all kinds is important on a day like today. Thank for reminding us of the try meaning and inspiration of this special day. What a great post for Memorial Day, CK. We remember and thank all those who have served our country. Well done, CK. Written with heartfelt tribute! How could we forget the military dogs (and cats)! Silly us! Of Course we thank them too for their service! Meow and thank you animal heroes! A solemn and gracious post CK. Really they partied. The US is a weird place where so many don't have stuff. Where people party on the dead. I am sorry for this. There are people who move heaven and earth for their friends, for the poor and for the servicemen who returned. We agree with you CK. This was a solemn day for remembering, not partying.